5 days, 4 countries, 3 friends, 2 abbeys, 1 trip! What initially started as a crazy idea of Fabio trying to save a bit of money on flight tickets turned out to be a very inspiring and unforgettable journey for the three of us. Leaving Delft the 23rd of July, hungover from the goodbye party after the exhausting final exam phase, we were all craving for a few days without using our tortured brains. By train we went to Maastricht (NL) from where we cycled across the border into Belgium to wild camp next to the Meuse River in a tiny tent. The next morning, we headed towards France and after a long, rainy day riding over a steep profile, we spent another night in the tent next to a corn field close to Durbuy (BE). The following day, we visited an abbey and crossed into France to Givet where Xavier, an incredibly nice Couchsurfer, invited us in his home and restored our forces with local cuisine and his extensive LP collection. The next day we did the Trans-Ardennes bicycle tour and arrived totally exhausted at our next Couchsurfing location in Charleville-Mézières (FR), where we could sleep in a hippy-like community and party with them until late night. On our last entire day, we visited another abbey and went back into Belgium, where we were warmly welcomed by Mailys, yet another Couchsurfer. After this, our paths sadly separated. Fabio went to Luxembourg to catch the flight (with his beloved bike) back home to Italy. 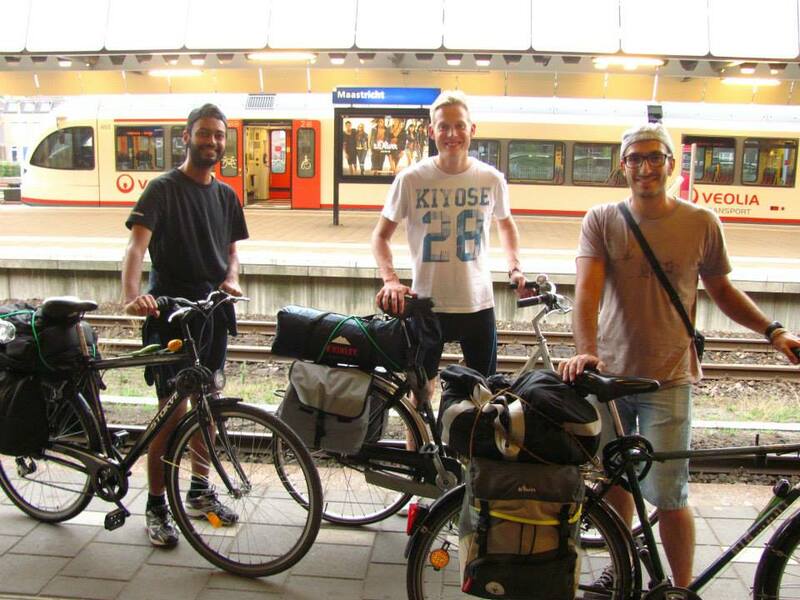 Piyush and Josias took the train back to Delft/Den Haag from where they started their internship and holiday plans. Five incredibly intense days! To read the full diary, clik here!